Magmar (like Lyonar also) has a staple 4 mana AoE that Magmar mains should craft ASAP, this time it’s Makantor instead of Immolation, but like my Argeon deck this is a cheap deck that you should add the epic to when you can. Other than that it plays a lot of decent minions, some of Vaath’s good removal and looks to bully the opponent by getting big and hitting them. I could joke about how you just have to walk towards them and play the card that matches how much mana you have available, but I think that’s probably a small disservice. Make sure you don’t take too much damage when trading your general into the enemy minions, which with your large Attack you often want to. It’s usually good to do so, but if you’re getting low without Earth Sphere in hand then don’t be stupid. 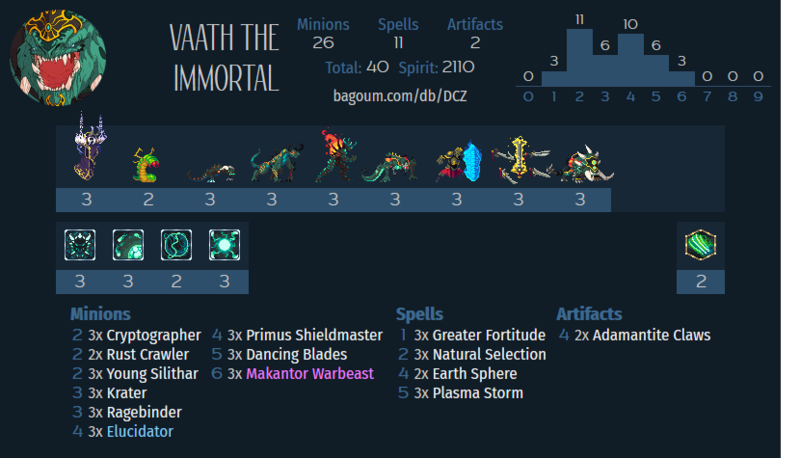 Vaath gets very hard to win with if you start running into a lot of Khanuum Kha, Titan or artifact solo decks, but outside of that he can be very intimidating against most other decks, particularly if his cards like Krater, Plasma, Earth Sphere or Makantor match up well. This one very much one of the best cards in the game, an instant 4 damage AoE with a pretty good choice on where you position it. This card is one your opponents will probably around as they start getting better. Even then it’s still great, often clearing a minion and getting General damage and leaving a body that they must clean up. Bonus points if you hit this into a 1 or even 0 attack enemy as then it will take more than a simple general hit to get it off the board. Our removal spells of the deck, there’s some minor anti-synergy, but mostly you have great opportunities to cast these of a game. Plasma in particular can wreck certain decks. Natural Selection is often great early or if the board is empty and they play a single creature. You could potentially run some other 3 drop, but I quite like the aoe ping for clearing certain things, like wraithlings, eggs, low health stragglers, clear forcefields or artifact charges. Just a nice bit of extra flexibility on the tools available to the deck. Our two drops. Silithar is one of the best 2 drops in the game, being quite resilient at times, and just burning extra actions from the opponent in order to clear it for good. Crypto can be quite big early to keep us up to speed with the average HP of our opponents minions, clearing enemies in 1 hit instead of 2 is a good deal, and the sooner you are boosting your attack the more unfair trading general damage is for your opponent. Rust Crawler is a concession to the fact that Vaath can struggle with artifacts, but he’s also servicable as an opening play with an acceptable stat line. If you never run into any artifacts you could swap if for a different 2 drop of your liking. The HP cost is worth what you get, with a respectable HP pool and a lot of attack. Similar to Makantor, you’ll often clear a target and force the enemy to trade another card or their HP in order to clean this up. make sure you don’t play too freely with your HP against aggressive deck, but even then a well-timed Elucidator could save you more than it costs. You can also use this alongside some of the other damage cards in the deck to pile on the pressure by being aggressive yourself. Since Vaath gets big, hits things and wants to be in melee he can end up taking a beating here and there. Earth Sphere helps to offset this, and is also huge in aggro matchups you may encounter. A fairly efficient way to quickly boost up your attack to clear larger minions or pulverize the enemy general into the ground. Great Budget options with good stats and abilities for their cost. Some of these neutrals you may have noticed keep cropping up in my budget decks, but I’m not going to say no to the power that they give relative to their spirit cost. Just a nice small buff that can make your minions that much more scary, you can use it to keep your minions alive another turn, to give them extra attack to kill something, for extra damage on the enemy general (On a Makantordoes both of those last 2) and also to put something out of range for Plasma Storm or Natural Selection. For the mana cost +2/+2 is quite a nice buff . There’s lots of goodies to upgrade into; Rebuke, Lavaslasher, Finality, Drogon and more.